Yes. 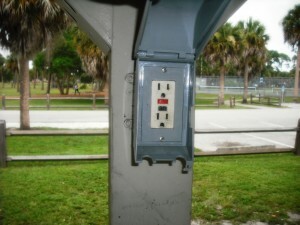 Most parks that have large pavilions usually have one or more GFI electrical outlets available to the public. However the following parks do not have electricity: Dreher, South Olive, Gaines, Howard and Coleman parks. The large covered pavilions have the grills and trash cans, some may have water fountain as well as restrooms and playground nearby. Many are equipped with ceiling fans and lights. 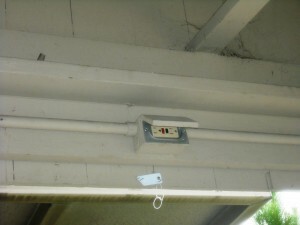 Electrical outlets can be located on the inside of the posts as pictured in first photo or you may also find them higher up as in second photo. Electrical power outlets are more and more in demand everywhere we go, especially today with our use of cell phones, laptops and other devices requiring power source. It brings a feeling of security knowing you can go to the park, enjoy yourself and not have to worry about running out somewhere else to go charge up your cell phone. It can all be done right there at your convenience.